Manchester City used to play at Maine Road which was in Moss Side. Yesterday they had Moss very much on their side as the Premier League referee made several blunders which all went in favour of the home side who went on to beat us 5-0. Let’s get one thing straight before I possibly go into a referee rant during this report, and that is the fact that Manchester City were better than us and deserved to beat us. Even had there been some fairness from the referee they would, in all likeliness, have won, but I thought the 5-0 scoreline was somewhat unjust against a City team who can thank their lucky stars they didn’t see at least one of their players get a red card while goodness knows how on earth Moss and his beleaguered assistant conjured up enough nonsense to award City’s second crucial goal. Ahead of the game, we got our timings right this time. Last season we found ourselves dashing to get into the ground for kick off but yesterday we were delayed only by the tram driver hitting his breaks as he came out of Droylsden which led to a delay as passengers nursed their bruises having been thrown about a bit. It was while waiting for us to start moving again that the team news came through and it was exactly as how I hoped when I wrote the match preview on Friday with Steven Defour and Jeff Hendrick returning at the expense of Ashley Westwood and Ashley Barnes. It was a first Premier League outing for Defour who, on his performances last season, it has to be said has been very badly missed. I read a thread this week on the message board about the delights of Maine Road compared to the ultra modern Etihad. 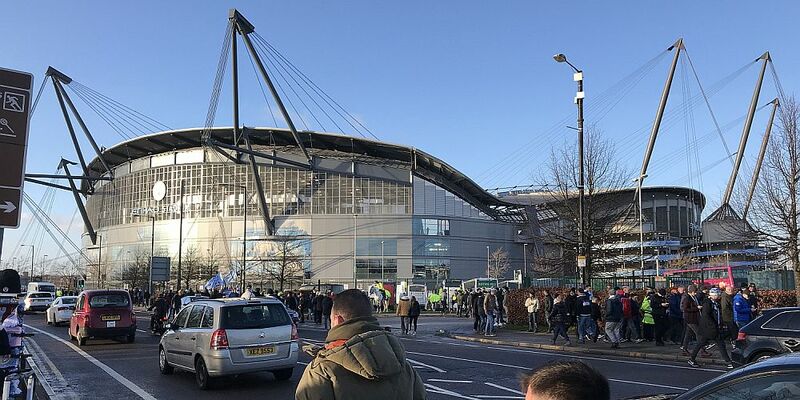 I was no fan of Maine Road at all and, modern bowl it might be, I do like the Etihad which continues to improve. The whole area is impressive with the campus but they don’t have the tightest of budgets when it comes to spending. As expected, Joe Hart received a superb reception from the home supporters when the teams came out and then from the fans behind each goal as he went to one to warm up before switching to the other end for the first half. We had Ederson right in front of us for the first half and what a dramatic start we got. Trying to play it out from the back, City got it wrong and Aaron Lennon got onto the ball only for him to go down under a challenge from Vincent Kompany. Eagle eyes to my right said red, and I’ve learned to trust his judgement. Referee Moss had the clearest of views and immediately went for his yellow card. Moss got it horribly wrong. It was a red card all day long and with less than a minute gone, City should have been playing with ten men. It might not have made a difference to the outcome but with it being in the first minute, who knows? An early red card for Gary Cahill last season at Chelsea certainly had an effect on the game although this City team is, admittedly, considerably better than the2017/18 version of Chelsea. City nearly paid immediately but Sam Vokes headed over from the free kick taken by Jόhann Berg Guðmundsson. They’d had two let offs in the first couple of minutes but we were quickly in their stride. We had, like most teams do at City, a difficult period to deal with. They missed one good chance, Joe Hart saved a couple of other efforts, we got some blocks in and, of course, Sergio Agüero did score, that goal coming as early as the 17th minute. But we held it at 1-0 and, in fairness, had a little bit of the play ourselves towards the end of the first half. The closest we came was following superb work from Jack Cork and Hendrick that led to Hendrick having a shot blocked by John Stones. Then, right on half time, Hart made the save of the game to prevent them doubling their lead. Obviously you don’t want to be behind in any game but, overall, we’d equipped ourselves well and, although the damage could have been worse, we went in only one behind and this is a place where we have come from behind before. We just needed to continue to keep it tight, ensure we didn’t fall further behind and there was perhaps going to be an opportunity to go and get something from the game. Nothing much changed in the opening minutes of the second half but then Moss and assistant Eddie Smart stepped in and took the game away from us, with a little bit of help from ourselves it has to be said. Leroy Sané went down in the box and I saw Moss put his whistle to his mouth and prepare to give a penalty. It would have been a dreadful decision; the only option Moss had open to him at that stage was to blow, give us a free kick and yellow card Sané for diving. He then, suddenly, opted to give nothing and play on, much to the disgust of some Burnley players, and this is where our contribution came in. Some of our players switched off and that allowed the offside David Silva to play the ball, which had, by the way, gone out of play, back into the middle for Bernardo Silva to score the second. It’s appalling from the officials. Moss should hang his head in shame for the whole series of events while Smart, who has apparently apologised for switching off, should join him in facing sanctions from PGMOL. You know any comeback is very unlikely at 2-0 and less than two minutes later, with us in total disarray and still arguing with the referee, two became three with a Fernandinho goal. It was now game over and time for damage limitation. I’d sort of enjoyed it up to that point, but from then on in it wasn’t an easy watch, knowing we were beaten and just trying to ensure there was no further damage. We somehow got into the last ten minutes at 3-0 but then City, who really should have been playing with ten, could then have had another player sent off. This one is not as obvious but the yellow card for Sané is very lenient, and in any case the German should have already been yellowed for the dive. I think we’d have all settled for 3-0 at this stage but it all went horribly wrong in the closing minutes as first Riyad Mahrez and then Sané both scored to give City the 5-0 win. Embed from Getty ImagesYes, they were worthy winners, but not by 5-0 and the helping hand given to them by Moss was just downright disgraceful. When, on Tuesday afternoon, the Premier League announce the referees for the next round of fixtures I sincerely hope Moss has not been given a game. It’s the best we can hope for but at least we’ll know his bosses weren’t happy with his performance. Were there any positives? Yes is the answer. Firstly we don’t have to come here again this season. This really is the toughest of fixtures. Since the beginning of last season, City have scored three or more goals on 25 occasions in the league, they’ve netted five our more on nine occasions including a 5-0 beating of Liverpool last season. That puts the task into perspective. The other positive was clearly the return of Steven Defour. It was so good to see him back in action in the Premier League and all of us with an interest in our club know we are a better side with him than we are without him. You can’t be too positive about a 5-0 defeat, no matter who it is against, but I do think too many things went against us yesterday. We would still probably have lost the game but I thought the scoreline was so unjust and the contribution towards it from Moss and Smart was just totally unacceptable. It really was like being back in Moss Side. Manchester City: Ederson, John Stones, Vincent Kompany, Ayremic Laporte, Benjamin Mendy, Bernardo Silva (Kevin de Bruyne 58), Fernandinho, David Silva (Phil Foden 75), Riyad Mahrez, Sergio Agüero (Gabriel Jesus 66), Leroy Sané. Subs not used: Arjanet Muric, Zinchenko, Nicolás Otamendi, Raheem Sterling. Yellow Cards: Vincent Kompany, Leroy Sané. Burnley: Joe Hart, Matt Lowton, James Tarkowski, Ben Mee, Charlie Taylor, Jόhann Berg Guðmundsson, Steven Defour (Ashley Barnes 75), Jack Cork, Aaron Lennon (Ashley Westwood 69), Jeff Hendrick, Sam Vokes (Chris Wood 69). Subs not used: Tom Heaton, Phil Bardsley, Kevin Long, Matěj Vydra. Yellow Cards: Jack Cork, Jeff Hendrick.